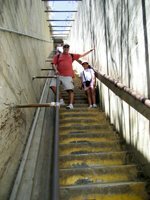 Diamond Head Crater Hike Offers Cheap Hawaii Fun and Scenic Hawaii Photos. Every great city has a unique signature attraction in its skyline. 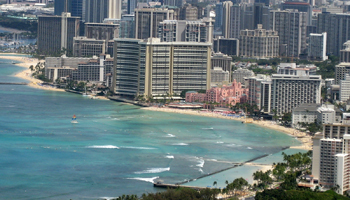 For Waikiki/Honolulu, that famous feature is the Diamond Head crater! This dormant volcanic tuff cone was originally called Le’ahi, which is possibly derived from the mountain’s profile looking like the dorsal fin of a tuna fish. However, when nineteenth century British explorers sailed toward the volcano, they saw sunlight reflecting off of calcite crystals and thought the sparkling might be diamonds. Whatever you choose to call it, Diamond Head crater is said to be the most photographed landmark in Hawaii – to the point that it has almost become synonymous with Hawaii. Before I moved here as a child, the pictures and souvenir stickers I had seen made me think Diamond Head was the entire island! Fortunately, there’s more to Oahu than just one crater. One of my favorite Le’ahi photos (right) was taken during a potluck at Kapiolani Park, when all of a sudden, something unusual about that night’s sunset momentarily painted the entire hillside crimson. I took the site banner photo (top) from a jetty at Magic Island; and I took the footer photo (bottom) looking down into Diamond Head crater from the summit of Koko Crater. 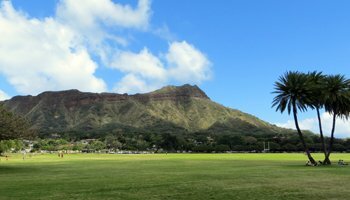 Other spectacular Diamond Head photos can be shot from Waikiki Beach, Punchbowl crater, and Puu Ualakaa State Park. 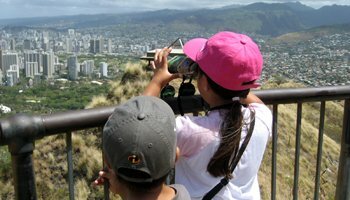 Admission to the Diamond Head state park is now $5 per car or $1 per walk-in visitor. And because revenues go to help fund improvements at all of Hawaii’s state parks, I think the experience is easily worth the cost! If you only go on one hike in Hawaii, I’d say dish out the dollar and do this one! 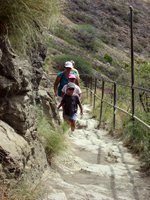 Just remember that the last entry to hike the Diamond Head trail is at 4:30; and you must exit the park before the gates are locked at 6pm. The 0.8-mile trail zigzags 560 vertical feet up the inside crater wall to the summit – making this hike somewhat steep and strenuous. Nevertheless, this trail is heavily traversed by hikers of all ages. 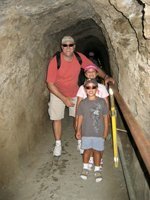 I first took my children on this hike when they were five and seven, and they did the entire distance without too much difficulty. The majority of the trail is hard-packed, slightly-uneven dirt. There are two flights of stairs and a 225-foot tunnel. This is also the only Hawaii hiking trail that I recall to have guard rails. There are restrooms at foot of trail. Carry your empty water bottles back down with you. There are trash cans at the foot of the trail. 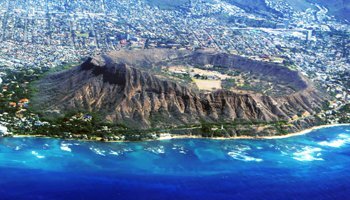 The 475-acre, nearly-perfect circle of Diamond Head crater was reportedly formed 300,000 years ago in one explosive eruption! The settling dust and debris hardened and formed the crater walls that we see today. The summit trail was blazed in 1908 to service a fire control station and bunkers that were part of Oahu’s civil defense system. Those who are interested in war history will appreciate the experience of touring these ruins. The summit observatory also overlooks a navigational lighthouse that was constructed in 1917.